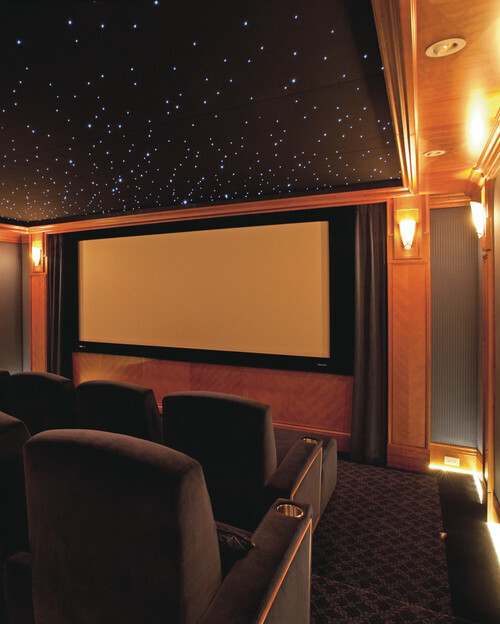 Private home theaters are becoming more and more popular. You want comfort, appeal and high-quality sound and video components. 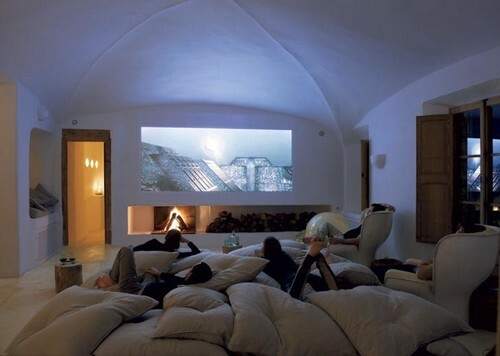 Here are 15 cool designs for home theaters. 1. 3-D Blu-Ray and TVs. 3-D technology is fast becoming the latest must-have audio-visual treat. Already, 3-D television broadcast channels from ESPN, Discovery and Direct TV are a reality. 2. Lampless LED technology and video projectors. High-intensity LEDs are much more energy efficient than traditional projector lamps and provide a clear, sharp image on a big screen. 3. Internet streaming capabilities. Internet-enabled devices include televisions, receivers, Blu-ray disc players and gaming consoles. Media extenders can also stream Internet content to your non-enabled entertainment devices. 4. Mobile accessibility. Mobile phones or tablets use Wi-Fi to communicate with a centralized control system for effortless switching between content sources, changing programs or adjusting light levels. 5. Sound options. 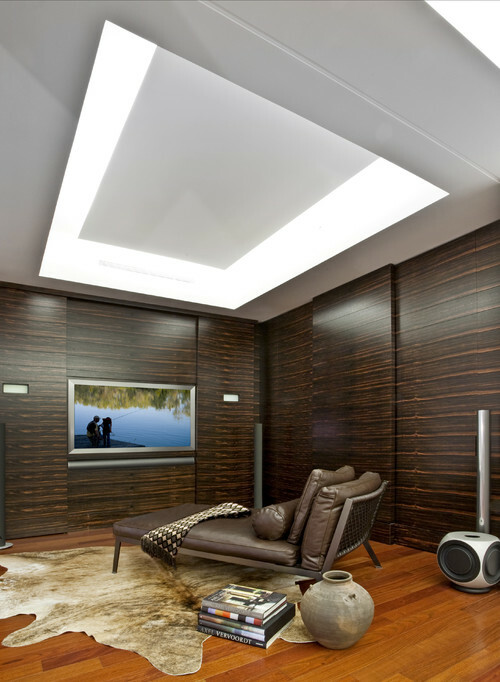 The trend in sound reproduction is toward more compact, wireless systems that are increasingly affordable. 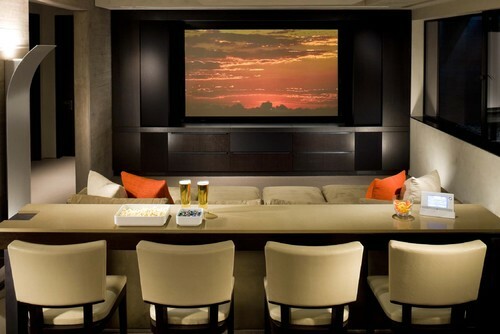 Contemporary Home Theater by Fort Lauderdale Interior Designers & Decorators b+g design inc.
6. Large-screen, high-definition TVs. The route to home theater satisfaction is more straightforward the extended choices in high-definition TVs. 7. Budget-friendly media room. The price of home theater products has dropped significantly while features and performance continue to improve, making the dream of your own home theater room a distinct possibility. 8. Multiple screens. 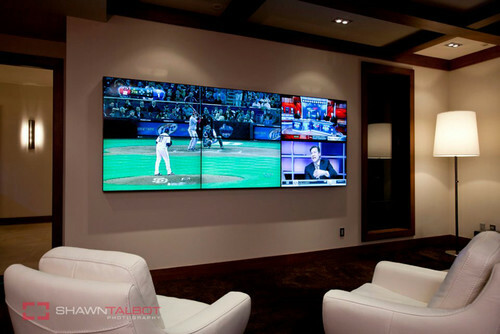 Multiple screens are mounted on the same wall, with a flat-panel TV for casual, everyday viewing that gets covered by a larger front-projection screen for movies and major events. 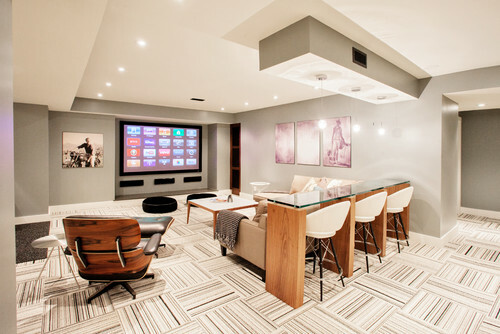 Contemporary Home Theater by Kelowna Interior Designers & Decorators Begrand Fast Design Inc.
9. Hybrid space. 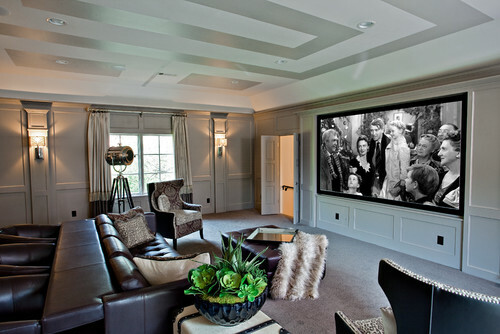 Instead of the traditional look of a dedicated home theater, more homeowners are incorporating sofas and chaise lounge seating instead of specialty theater seating. 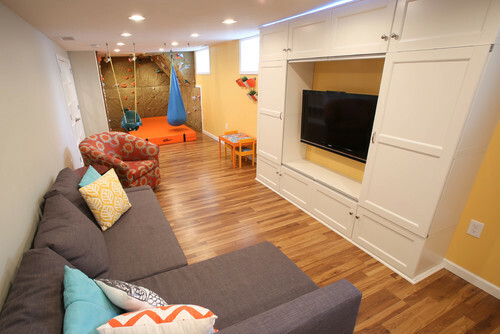 This basement home theater even features a small rock climbing wall, punch bag, and swing for a toddler. 10. Social Networking. Social media TVS drive the desire to be linked to the Internet while watching movies, sports or TV shows. Seat the entire family with bar stools, reclining seats and large throw pillows. 11. Underwater feel. A 360-degree oceanic mural creates the impression of rolling waves and LED lights softly glow behind the screen, providing the sensation of being in an aquarium. 12. 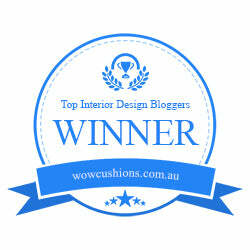 Wow factor. 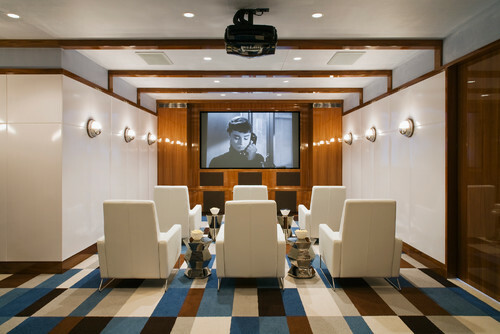 This theater is designed to be the centerpiece of the home, a room to serve as the primary space for family gatherings and entertaining guests. 13. 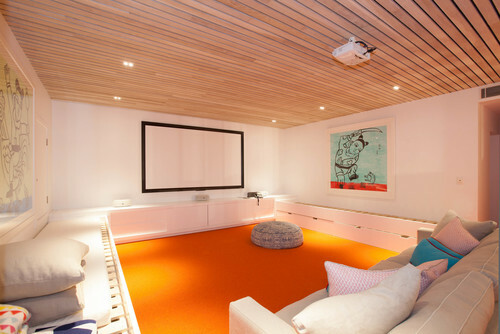 Low-ceiling basement. House a projector in a separate enclosure at the back of a basement with low ceilings. If you can’t install tiered seating, simply choose pod-shaped gamer seats. 14. Outside in. Fiber optic lights provide a starry night ceiling, making audiences feel as if they are outside. 15. Mountain chalet. 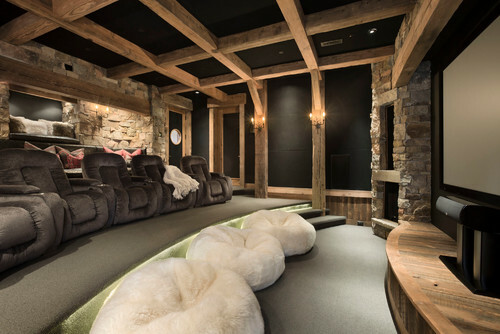 This home theater design features unique interior acoustical materials that resemble rocks to offer a balanced sound field despite the small space of the room. 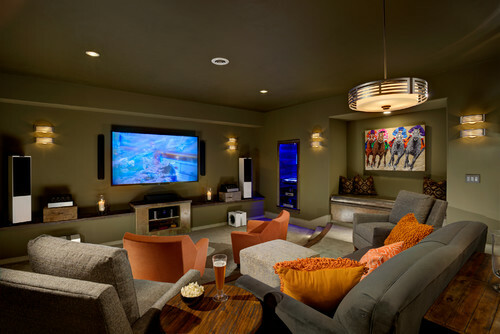 With a little inspiration and proper innovation, you can design a home theater to meet your needs and stay within your budget.